I know the official start of summer isn’t for another month, but the warm weather that we’ve got right now is clamouring for picnics, sunny patios and long bike rides. I’m digging it. I made this salad last night for part of a late evening dinner. I’d love to say that I ate this with some grilled chicken kabobs or something equally summery and outdoorsey. But I ate this alongside some popcorn and a glass of beer. I was alone for dinner while watching the last episode of Mad Men (so good!) so who’s going to call me out on it? Uh, I guess that would be me. It was an enjoyable solo meal, what can I say? 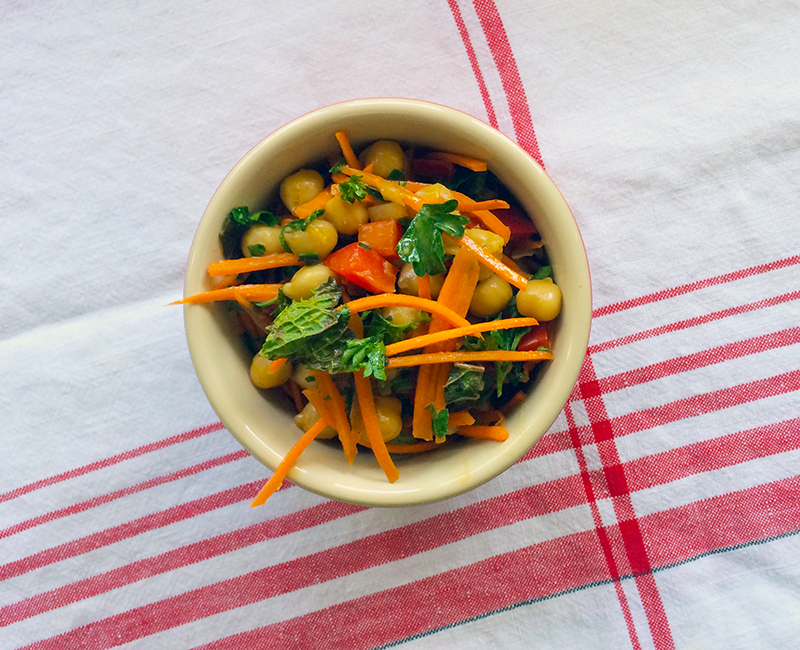 For chickpea salads, I love using dried beans because they really do taste better. But canned ones are so easy, and because I didn’t have any cooked from scratch beans on hand, canned worked out just fine. There’s lemon and cumin to make this salad sing and the fresh mint and parsley make this salad so refreshing and a bit unusual. I loved it a lot. The vegetables are up to you, but I loved the julienned carrots and diced red pepper for their crunch and colour. Cucumbers and cherry tomatoes would be great additions too. This is one of those great summer salads because it’s portable. 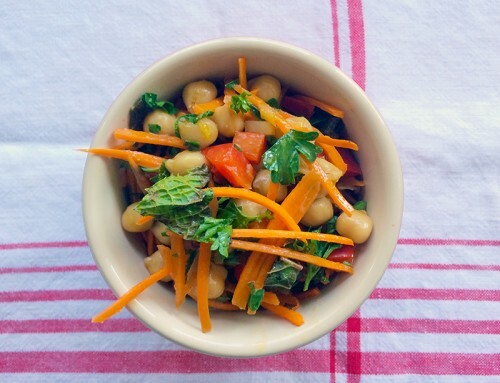 Take it to a summer barbecue, bring it along on a park picnic, pack the leftovers for lunch. There’s no lettuce to get wilty and there’s no mayo to make things risky. Pack it into a mason jar, bring along a baguette, some hard cheese and bring a growler filled with your favourite brew. With your basket or panniers secured, hop on your bike, find a local park and bring along some friends. I see a great last minute picnic in your future! I know I’m going to forget to write about our travels last month, so I’m going to give a quick rundown of our rust belt tour. We crossed the border from Toronto into Buffalo which we stopped for lunch (thanks to the reader tip from Abi to visit Amy’s) but would love to visit the city further. Pittsburgh was incredibly beautiful! Seriously, what a gorgeous city. We only spent one night but I’d love to visit again with more time. If you love art, The Mattress Factory is a must do. Our airbnb was just 2 blocks away in the Northside neighbourhood and I loved walking around all the old row houses and exploring the alleyways. We also rode the funicular which was a treat. We stayed 2 nights in Cleveland in the Ohio City neighbourhood in a new hostel which was the perfect base for our explorations. I loved Cleveland! It seemed bike friendly and walkable, well, at least in the 2 neighbouring hoods where we spent most of our time. We loved the beers and the space at Platform Brewing and of course we had to visit Sokolowskis for a heavy Polish lunch. A stop in nearby Chagrin Falls is a must do. Not only is it a very picturesque town (picture the Gilmore Girls’ Stars Hollow and you’re right on the nose) but it’s a great stop for ice cream at Jeni’s. We also spent a night in Detroit and we had a blast. We also noted how things have changed for the better since we were last in Detroit briefly 3 years ago. I can’t wait to go back. We ate the best bbq of our lives at Slow’s (where they also have a killer beer list), then we jetted off to the incredible DIA for the Diego Rivera & Frida Kahlo exhibition and to check out the rest of the art collection. We woke up early on Saturday to check out the Eastern Market which reminded us so much of the Jean Talon market in Montreal (probably my most favourite market that I’ve been to). Breakfast was at the very adorable Rose’s Fine Food which took us back to the border into Canada and onwards to my family. There you have it. The Rust Belt, a great little road trip! 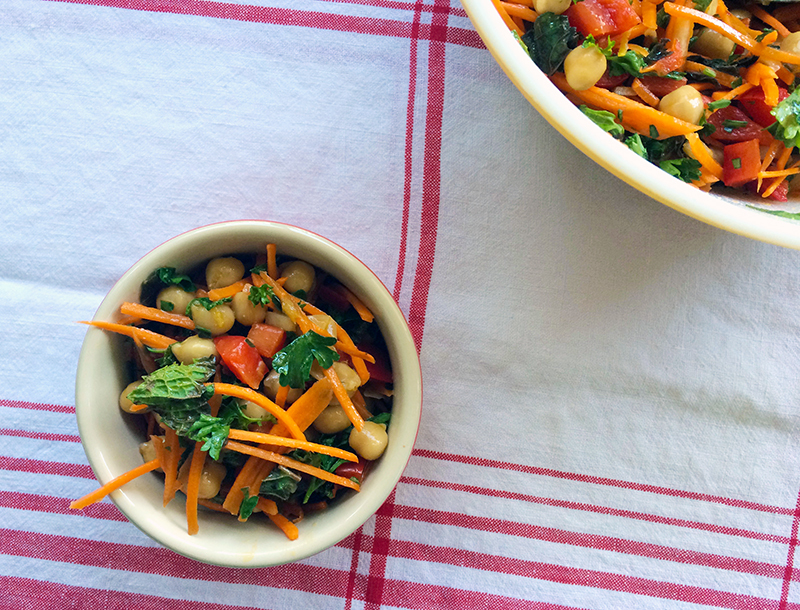 This salad is tasty the day you make it, but it benefits from a night in the fridge. I’m eating this for lunch right now and the flavours just explode in my mouth. 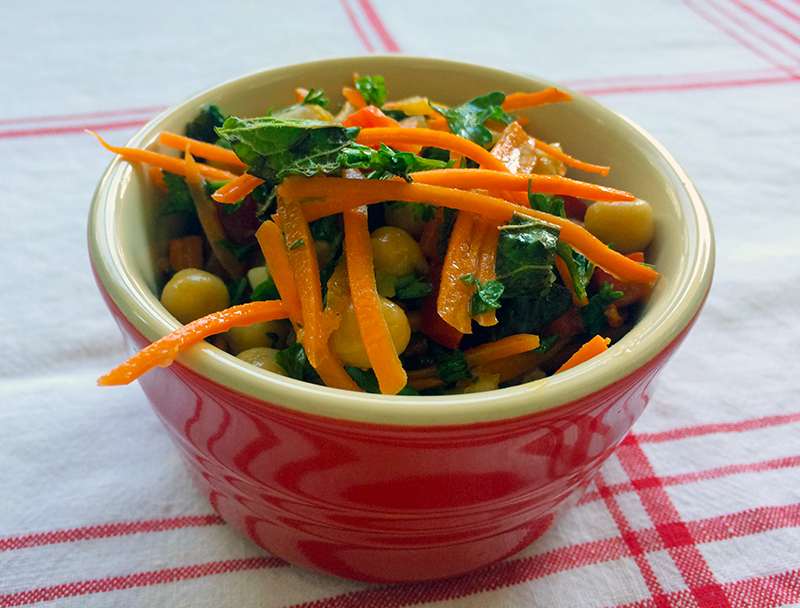 In a large bowl, toss together the chickpeas, red pepper, scallions, carrot, mint, parsley and lemon zest. In a small jar, combine the remaining ingredients, put the lid back on the jar and shake. Taste and adjust seasoning if needed. Pour over salad and toss. Let the dressing marinate the salad for at least 30 minutes before eating or marinate over night. Serves 4-6. Hi there, I just had to say that we spent an afternoon in Detroit several weeks back (our son graduated from Business School in Ann Arbor), and had lunch at Slows. It was terrific and I was able to carry some of that brisket (very carefully wrapped in my tote bag) back with me to California. We went to the Motown Museum; try that the next time you’re in Detroit, it’s so much fun! This was delicious! The lemon and mint were a delicious combination and the dressing is just the right amount. I threw a bit extra onto my kebab veggies and it was so tasty. Five stars and a few more. Thanks Sues, I think so too! Your trip sounds like lots of fun! I saw your photo of the market on instagram. It looked pretty epic. I really would like to see the Diego Rivera mural etc. And of course, have some of Jeni’s ice cream!! This chickpea salad with mint sounds yummy. I have tons of mint growing like crazy in the backyard so a perfect reason to use some up. Joanne, this is totally in your neighbourhood! You should take a few days or even a week and go on a little road trip. There were so many amazing surprises – it was a great trip. Jealous of your mint excess!! We’ve been eating mint a lot here lately.